We like the idea of a sound bar for smaller rooms and smaller TVs, but the Boost TV’s performance leaves much to be desired. Not everyone has the space for a full-sized TV or sound bar in their bedroom, den, or motorhome. 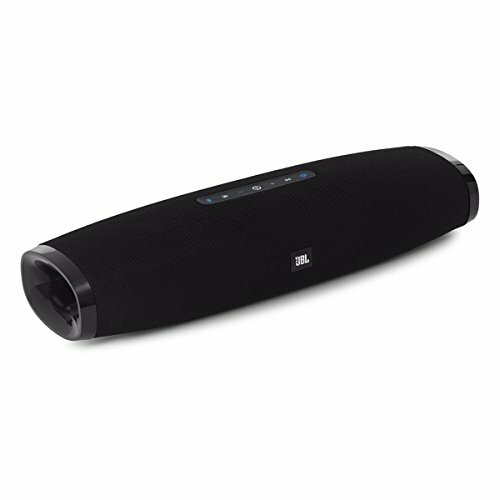 Nor do they necessarily want one: when used in a small room, a full-sized sound bar like the Sonos Playbar or the Yamaha YSP-1600 will likely provide more volume than you really need. And if you have a smaller television, pairing a standard-sized sound bar with it could wind up looking a little bit goofy. 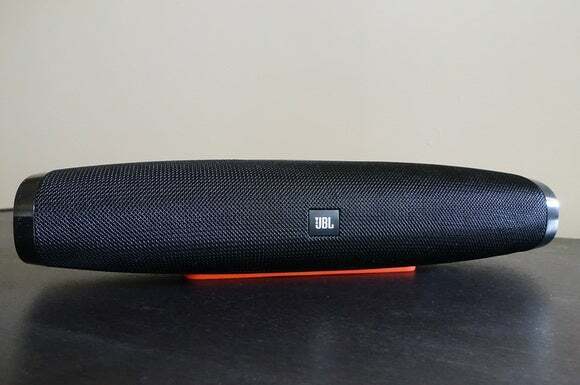 JBL's attempt at at small sound bar misses the mark, delivering a poor performance with video sources. These are problems the $200 JBL Boost TV was designed to address. 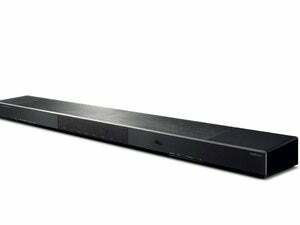 It’s a sound bar that measures 3.0 inches tall and just under 15 inches wide. But don’t let its small size fool you; it’s still capable of producing more robust sound than the weak-sauce speakers that come built into most flat-screen TVs these days. Covered in a chunky weave of black acoustic cloth, with a row of backlit buttons on top and shiny plastic end caps designed to amplify the speaker’s bass frequencies, the Boost TV’s aesthetic is tasteful and subdued enough that it’ll look at home in most environments. The wafer-thin, membrane-button remote is destined to become lost in your couch cushions. Setting up the Boost TV proved simple enough. 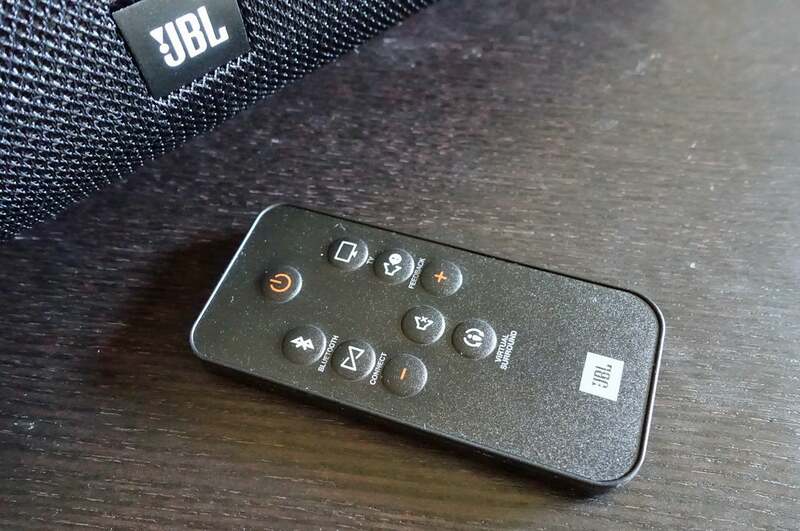 It comes with both a 1/8-inch aux cable for analog connections and an 1/8-inch optical for digital ones are included in the box (JBL must have concluded HDMI was overkill for a speaker this size). But its designers did have the good sense to swath the area around the Boost TV’s ports in orange rubber, making it easy to see which port is which, even in a dimly lit living room. This orange rubber wraps around the bottom as well, making for a slip-resistant foot to keep the Boost TV from sliding over the surface of a freshly polished entertainment center shelf. Sadly, a shelf is where it’ll have to stay. There’s no way to mount Boost TV on a wall and, while it might be the same size as some large portable Bluetooth speakers, Boost TV has no internal battery. In short, you’re limited to where you can use this thing. Remember the row of backlit buttons on the top of the speaker I mentioned earlier? You’ll rarely use them—Boost TV is, after all, designed to be used with a television. As such, it comes with a remote, which I think you’ll quickly grow to hate. Black in color and wafer thin, it’s pretty much designed to be lost down the cushions of a sofa or chair as soon as you set it down for the first time. It’s cool though, as its cheap membrane covered buttons and weak IR blaster make the remote loathsome to use. The orange rubber surrounding the ports makes them easy to find (you won’t find an HDMI here, though). Happily, JBL designed the Boost TV to be compatible with a wide range of universal remotes. If connected to a television via optical cable, Boost TV will power on with your flat-screen. 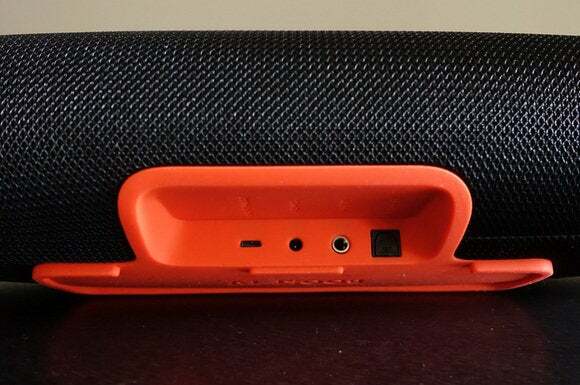 And thanks to Bluetooth, it’s possible to connect up to three additional tablets, smartphones, or computers to the speaker, making it easy to play your favorite streaming music or other device-based audio on it too. When you’re ready to watch TV, pushing the SoundShift button on top of the speaker or on the Boost TV’s remote instantly kicks the audio source back to your flat-screen. With its 30-watt amplifier, dual 2.0-inch transducers, and the pair of bass ports baked into the speaker’s endcaps, the Boost TV sounds pretty good—but it doesn’t sound great. To get a sense of what the Boost TV could do for a mediocre television’s audio, I connected it, via optical cable, to the 32-inch Sony KDL-32R400A in my bedroom. While it lacks a connected subwoofer, the Boost TV did wonders for the explosions and the pop of gunfire in Edge of Tomorrow. It also improved the ambient noises in the film, such as the dripping of water and the crunch of boots on concrete. Turning on the Boost TV’s Display Surround Technology bumped all of this up a notch. 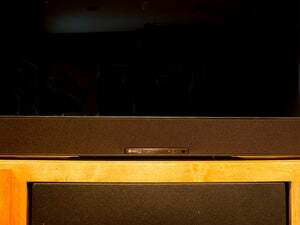 While the tech can’t even begin to touch true surround sound, it created an aural ambiance in the room that anyone looking to improve the middling sound of a small flat-screen will appreciate. Until you give it a challenge, that is. I was disappointed by how muddy the Boost TV’s sound got as it tried to cope with more complicated content. During the final star-fighter battle in Star Wars: The Force Awakens, for example, I noted that much of the mid- and high-frequency noise got lost in the low-frequency sound that the speaker was cranking out. At higher volumes, this wash of noise persisted, but much of the bass was lost, giving way to tinny audio which, while louder than my TV on its own could produce, wasn’t of much better quality. I also wasn’t thrilled with what the Boost TV did for the voices of the actors on screen. I noted an echo any time anyone spoke, no matter the setting. Even changing the audio source and film I was watching made no difference. You won’t find much need to use the Boost TV’s buttons (unless you lose the remote control, of course). The issue was repeatable while watching Blu-ray discs as well as Netflix and Apple TV content. The Boost TV did marginally better with music piped from my iPhone. Listening to Glen Hansard’s “Drive all Night,” from the album of the same name, I enjoyed much richer-sounding bass and a wider sound stage than I encountered while watching video. Elle King’s “Where the Devil Don’t Go,” from Love Stuff, sounded just as satisfying. Her vocal-fried snarl sounded clear, with decent separation of each member of her backing band’s instruments. 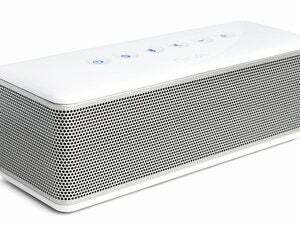 Upon moving the Boost TV and my flat-screen out into the living room to repeat the tests I’d put it through in my bedroom, I found that the speaker simply didn’t have the power to fill the larger space with sound in a manner that justified its $200 price tag.